The Staples boycott is over, and the union won. The Postal Workers (APWU) announced January 5 that the Postal Service will terminate its deal with Staples, closing down the 540 “mini-post offices” inside stores by the end of February and nixing plans to expand them to all 1,600 locations. The union fought for three years against the deal, which amounted to contracting out post office work to the low-wage, non-union office retailer. Staples opened its first postal counters in 2013. They offered a selection of the services APWU members provide at post office windows, including stamp sales, first-class domestic and international mail, and priority and express mail. Customers paid the same rates they would in a real post office—but Staples got a discount from the Postal Service, and pocketed the difference as profit. The APWU kicked off its boycott in 2014 with a series of delegations to stores and then a national day of rallies in 56 cities. 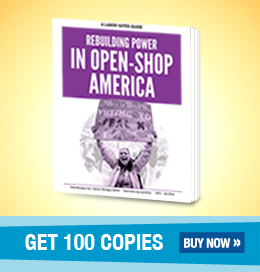 But day in and day out, the heavy lifting was done by small, dogged crews of postal workers and retirees who spent three years leafleting outside Staples in six metro areas: the San Francisco Bay, Atlanta, Boston, New York, Philadelphia, and Pittsburgh. The Boston committee, six full-time postal workers and five retirees, went out to stores four to six days a week. They started a database to track where union members lived, so they knew who to invite to rallies nearby. A half-dozen mornings they visited the corporate headquarters in Framingham, Massachusetts, waving “Stop Staples” banners as cars flowed into the office park. “The first time we didn’t know what to expect. We were all a little nervous,” Thomas said. “People were honking their horns, and we expect a wave—they’re sticking their middle fingers up.” Afterwards he took the crew out for breakfast. The threat to postal jobs wasn’t hypothetical. In 2012 the Postmaster General launched a multi-phase POStPlan, targeting post offices around the country for reduced hours or closure. Postal workers have also been battling closures of mail sorting plants and attacks on door-to-door delivery standards. In 2014, the newly elected Dimondstein led the four postal unions in forming an alliance to defend the postal service against these attacks from its own management. The union believes in expanding services and extending hours for customers, Dimondstein said. But there were three reasons it had to “draw a line in the sand” against the Staples deal. First was the quality of service. “Through no fault of their own,” he said, “Staples workers were not trained and accountable to understand the sanctity and privacy of the mail.” The union offered to give the program a try if the Postal Service would agree to staff the Staples counters with union postal workers, but it was turned down. Second, this was the tip of the spear of privatization. “We felt—and we turned out to be right—that the Staples effort was the acceleration of the privatization model they wanted to do with a number of major retailers,” Dimondstein said. In Philadelphia, a committee of three concentrated on the six big Staples stores. They leafleted every day for up to five hours, asking passersby not to shop there and explaining why. “I really loved it—which is why I was a window clerk for 35 years, because I love talking to people,” said June Cohen, a union steward who worked full-time on the campaign before she retired. “Once they know what you’re about, they start talking about their lives, their jobs, their kids. “People made connections with losing their job because it was being privatized, or not being able to find a decent job. It’s part of the same big picture. Alan Menjivar, who has worked for 33 years in the post office box department, took union leave to organize the Bay Area campaign. To ensure a good turnout he and others would phonebank one night a week, calling members of various area locals of the four postal unions. They also visited postal workplaces, labor council meetings, and local membership meetings to find more volunteers. Three or four teams could cover 13-15 stores, going out six days a week in teams of two to 10. A half-dozen retirees were regulars, often bringing their friends. Besides postal workers, the campaign teamed up with other unions and groups, supporting their campaigns and getting support in return. In Philly, the group teamed up with Fight for 15 activists and with the Caucus of Working Educators in the teachers union. Four of the targeted Staples stores were in the same malls as Verizon Wireless stores. So during last year’s Verizon strike, Stop Staples campaigners joined strikers on the picket lines. “They would hold our signs, and we would be the go-betweens between them and customers,” Cohen said. The Boston group joined Verizon pickets too, and met weekly with a group of Harvard student labor activists—the university’s President Drew Faust is on the board of Staples—and supported the dining hall workers' strike there last fall. Members worked with the Industrial Workers of the World and the local Jobs with Justice coalition too. The AFL-CIO and national teachers unions signed onto the boycott—important since teachers are big purchasers of school supplies, often on their own dime. Recently so did the global service workers federation UNI; Staples does business in 27 countries. It helped that Staples was vulnerable, its sales already declining. The chain closed dozens of stores a year between 2013 and 2016. It also lost big money last year when it abandoned its effort to merge with Office Depot, after the Federal Trade Commission sought an injunction on anti-competitive grounds. The union had joined with consumer groups to oppose the merger. Staples paid a $250 million penalty, Dimondstein said, on top of hundreds of millions in legal fees to formulate the failed deal. At the Staples stores in Philadelphia, “most days we turned two, three, four people away,” Cohen said. If that doesn’t sound like much, consider that those people stayed away for good. Meanwhile a court case was wending its way through the Labor Board process. In a withering November decision, administrative law judge Paul Bogas found that the Postal Service had illegally refused to bargain over the outsourcing—and detailed how the agency has spent the past decade lying through its teeth to the union about the purpose of its retail partnerships. The Postal Service created its “approved shipper” program in 2005. The program includes UPS, Office Depot, and various mom-and-pop grocery stores; it went through 10 versions before Staples. All along the Postal Service has claimed its deals with Staples and other partners were aimed at expanding options for customers. But internal documents produced in the legal battle revealed what the union had suspected all along: management’s explicit goal was to divert mail away from post offices and reduce its labor costs by cutting staffing. As part of the case, the Postal Service accidentally made public—then tried to suppress—a 2012 “retail channel strategy” document from consulting firm McKinsey, which linked the post office closures to the outsourcing. The document outlined a plan to encourage customers to “migrate” the majority of mail volume away from post offices to “the lowest-cost channels”: 12,000-22,000 retail partners. The Postal Service would maintain just 4,000 post offices, compared to the 31,606 it has now. The judge’s decision may have been the last straw that prompted the Postal Service to back down. But management could easily have appealed it. Dimondstein credits the victory more to the economic pressure the union brought against Staples through the boycott and opposing the Office Depot merger. The victory at Staples comes six months after the union won a contract that shrank the gap between tiers of postal workers. The contract campaign emphasized member involvement more than ever before. In that contract, the Postal Service also agreed to a moratorium on creating any new retail partnerships—in return for the union agreeing not to target its other existing partners, which include UPS and Office Depot. The moratorium expires in July. In the meantime Dimondstein is optimistic about constructive negotiations over the programs’ future. “We’re hoping the Post Office sees that these deals are not even good for the Post Office,” he said. A version of this article appeared in Labor Notes #455, January 2017. Don't miss an issue, subscribe today.